A.L.I.C.E. * is possibly the ultimate adventure bike: designed for world travel, bike-packing, gravel-grinding and grand days out. Sliding/replaceable dropouts: supplied with 142mm bolt-through axle. Custom CrMo fork with rack mounts, mudguard eyed and extra bosses for bottle cages/accessories. Specifications or extras offered are subject to change without prior notice. 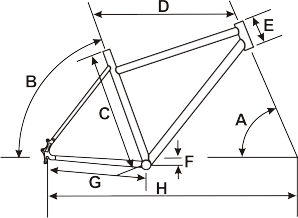 Geometry is calculated using a 432mm rigid fork (axle to crown). See geometry schematic below for more information. 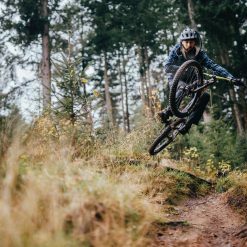 If a 395mm CX-style fork is used, head angle and seat angle will steepen by approximately +2 degrees, BB drop will be 70mm and trail will be 58mm. For information on Reach & Stack, click here. The A.L.I.C.E. frame uses custom, triple butted, heat treated, CrMo 4130. 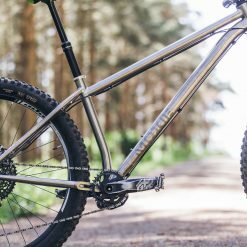 This super-alloy is drawn and butted in the same factory that our frames are fabricated in which allows us to not only keep everything in-house, but to also draw on their technical expertise as leaders in this field. The strength of the tubeset is comparable to branded tubesets like Reynolds (725 & 853) or True Temper (Versus HT), for example. A.L.I.C.E. uses a custom 432mm fork so you can use of 29×2.1" tyres. It also gives the bike a more relaxed geometry for stability when loaded (e.g. carrying bags or racks and panniers) and long-distance comfort. Switch it out for a 'conventional' 395mm fork though and the geometry will be more aggressive and typical of a CX mud-plugger. Gear-train, brakes, levers/shifter(s), handlebar and bar tape. (Acepac kit shown is for illustration only). The top assembly is ZS44/28.6. The bottom assembly is ZS44/30 or EC44/40 with a Lower Crown Converter. Tyres Maxxis Pace 29" x 2.1"